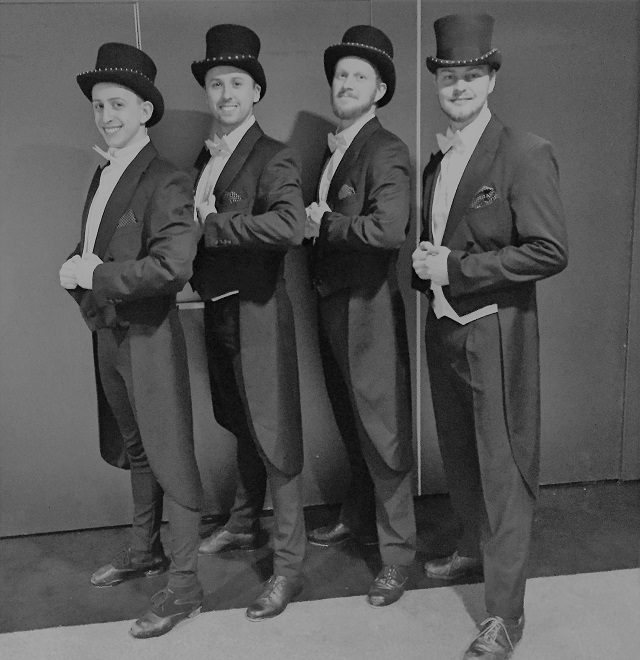 The weather may be cold and miserable outside but our fantastic male tap dancers have been turning up the heat at a one of our recent events! Our brief for this event was to provide four of Event Dancers UK male tap dancers to perform 2 x show stopping routines at a 1920’s/Hollywood themed event. The evening was being held at the splendid Hilton London Syon Park Hotel. To make the performance even more spectacular our client enlisted the services of Britain’s Got Talent Finalists ‘The Jack Pack’ who are now a well established act in their own right embarking on UK Tours, albums and who are hugely popular on the corporate entertainment scene. Two iconic swing songs were performed by our tap dancers and Jack Pack singer, the first performance Putting on the Ritz and the second performance the Benny Goodman big band classic, Sing Sing Sing – both perfect for the theme of the event. We are extremely proud of our fabulous tap dancers who are all at the top of their game performing at prestigious events and shows worldwide. We were fortunate enough to capture the guys in action in their second performance in the video below – we are sure you will agree the audience were more than impressed! Our 1920’s themed dancers are still proving extremely popular for events. We are also seeing a crossover in this trend to ‘Peaky Blinders’ themed events this year. Our 1920’s themed entertainment is also perfect for this theme. From our dapper tappers to Gatsby Girls, Art Deco/Vintage Burlesque performers, Vintage Showgirls, Vintage Usherettes, stilt walkers and fire performers we can cover most entertainment options to fit this theme of event. Bespoke costuming is provided in house for our performers which we are happy to discuss with you. So if you are feeling ‘peaky’ or looking to get your glad rags on please do not hesitate to contact us today to discuss your thoughts, ideas and inspirations for your next event – we look forward to bringing them to life…..